In the last 10 years, hundreds of tribal groups across the US have adopted renewable energy like solar and wind as a way to serve their community needs better. The type and size of the solar installation depends on the needs and goals of each community. Each group has adopted it in unique ways, from large utility-scale projects where the tribe leases land to a developer, to small solar-plus-storage systems designed to provide electricity to rural homes that are too distant to connect to the electric grid. Reasons and goals vary among tribes. Some desire greater independence from the utility, while others want to set a higher standard of living for local residents through greater financial independence. Others want to bring electricity to rural households. But one goal is shared: to adopt an energy source that offers clean, renewable electricity. These projects are thriving, helped along by the US Department of Energy Office of Indian Policy and Programs, which has granted $50 million to over 200 efficiency and renewable projects on tribal land since 2002. The office recently announced another $9 million in funding to 16 more projects as well. Let’s look at three of these innovative solar projects on tribal land to see the varying needs of the different tribal groups and the diversity of the solar installations to meet these needs. The Hopi government has long been focusing on rural electrification to better the lives of the estimated 18,000 homes without electricity on the northern Arizona reservation. In 1987 the Hopi tribe created the Hopi Solar Enterprise, a unique organization that puts together solar-plus-storage kits comprising solar panels, batteries, and all the necessary components to make it work. Residents on the reservation can purchase these kits on loan and pay the Hopi government back in low monthly installments of around $60 to $90 over 15 years. During the 15 year loan, the organization provides training on use and maintenance of the system and at the end of the 15 year agreement term, ownership of the system turns over to the household. The organization works as a revolving loan program – meaning that any loan profits are turned around to offer loans to even more households. In 2002, the organization became an independent for-profit business known as NativeSUN. Around 14% of residents on tribal land lack electricity, 10x higher than the national US average of 1.4%. This solar-plus-storage rural electrification project is a prime example of small scale solar installations filling this need. In fact, due to the success of the project, the Navajo Tribal Utility Authority adopted a similar program for the much-larger Navajo reservation to provide power to the estimated 10,000 to 30,000 homes without electricity. The reservation now has over 200 projects to date. In southern Nevada on the outskirts of Las Vegas, the Moapa Paiute tribe has leased 2,000 acres of desert land to First Solar, a large-scale solar development company, to construct a 250 MW solar power plant on the reservation, which will produce enough electricity to power 100,000 homes. The project began in 2012 and is expected to be up and running in November 2016. The installation includes 3.2 million solar panels, a new electricity substation, and a 5.5 mile transmission line to the nearest existing substation, which connects to the California electrical grid. The electricity is purchased by the Los Angeles Department of Water and Power under a 25 year power purchase agreement and the project provides long-term income for the tribe, as well as job opportunities. Through negotiations with First Solar, the tribe ensured that 25% of all construction crew openings would go to local residents and that after the installation is complete, part of the 7 full time employees will be local residents as well. First Solar expects the tribe to make millions of dollars from the project from land leasing revenues, consulting fees, and sale of local materials. 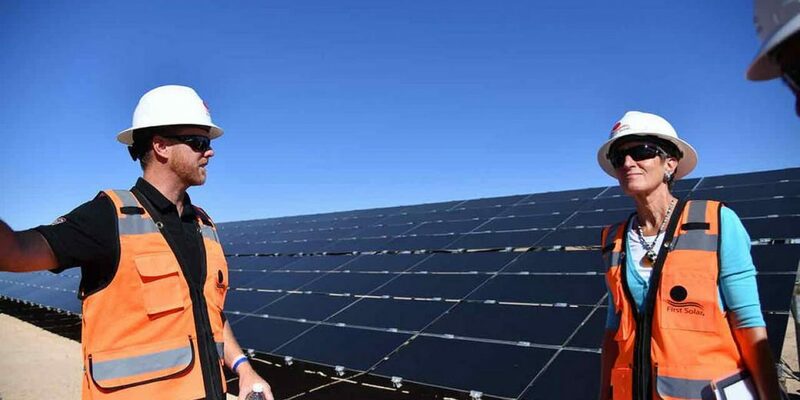 The project uses First Solar’s innovative thin-film solar panels, which see greater production in hot climates like Nevada and which allow the system to produce up to 8% more energy than with conventional polycrystalline silicon solar panels. Developers also used an innovative mounting system, as the geologic make-up of the soil also proved a challenge for traditional mounting systems. The ground typically has 10 inches of sand underneath a rocky surface, with 2 feet of hard-packed sand and limestone known as caliche further underneath. Because of these challenges, the solar developers settled on TerraSmart’s proprietary ground screws – literally screwing the installation into the earth at 128,000 points! Even surveying and marking the land was an issue, as markers wouldn’t stay in the loose sand. To account for all these challenges, TerraSmart created a system where the land was surveyed and drilled, and then the screws were installed all at once. Utility-scale solar installations are capital intensive and tribal groups need large sums of money to begin the process. For many, this just isn’t feasible on their own and they turn to grants from the federal Department of Energy as well as private partnerships to being development. By working with First Solar, the Moapa Paiute tribe has created the first and largest utility-scale solar plant on tribal land and brought additional income, jobs, and development to the area. In September 2016, the Moapa Paiute tribe received federal approval to construct an additional 100 MW of solar through an arrangement with First Solar similar to the previous agreement, emphasizing the success of the first project. Blue Lake Rancheria is a small tribe in northern California that set forth a climate action goal in 2008 to reduce greenhouse gas emissions. Since making that initial goal, they have reduced their energy consumption by 35% since 2008 and plan on further reducing by 40% by 2018 through energy efficiency, renewable energy, and fuel-switching to electricity and biodiesel. Because of these efforts, the Obama administration recognized Blue Lake Rancheria as a Climate Action Champion in 2015-2016 along with 16 other communities. Partnering with Humboldt State University, Siemens, and the Redwood Coast Energy Authority, the reservation built an efficient micro-grid based around renewable energy to power the entire reservation, including government offices and a casino. It includes a 500 kilowatt solar installation, 950 kilowatt-hour electricity storage bank, and an innovative 175 kilowatt biomass electricity plant, which uses wood fuel that’s heated to 2,000 degrees F to produce hydrogen, which then powers a fuel cell to create electricity. To ensure reliable, high-quality electricity, the entire micro-grid is monitored by Siemen’s monitoring system designed for micro-grids. The project was funded in part by a $5 million grant from California Energy Commission. Each project in each community is quite different, spurred on by the needs of the local residents. The Hopi needed rural electrification. The Moapa Paiute tribe sought community development, and Blue Lake Rancheria set high goals of greenhouse gas reductions. Each solar development met these goals in unique ways. As solar becomes more affordable and more widespread, we’ll continue to look at solar projects on tribal lands for creative and innovative solutions to deployment and problem-solving.